Instagram, the wildly popular photo and short video sharing app launched in 2010 is now expanding. Originally starting off just as a photo sharing service with filters, it has now grown pretty much into a social network, adding video sharing along the way. This boom even caught the eye of the folks at Facebook, who bought Instagram for a whopping 1 billion dollars in April 2012. After the introduction of Direct Messaging in December 2013, Instagram hasn’t really offered anything new, so Bolt is a welcome new addition for Instagram lovers. Here’s more about the new Snapchat competitor! Instagram Bolt – The Snapchat and Taptalk Killer? The premise of Instagram Bolt is very simple, it lets you share photos and short video clips with a single tap that will disappear once viewed. It’s essentially the same thing that Taptalk does, only with a different UI and the Instagram name on it. 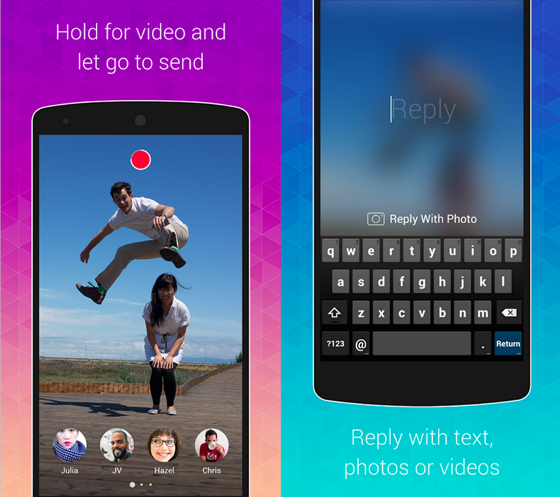 Tapping on a friend’s picture lets you send them a picture, and long tapping lets you send a video. Once the recipient swipes it away after viewing, it’s gone. Apart from the very obvious ‘private’ chats that will happen, Bolt is aiming to fulfill sharing the need for sharing pictures or videos that aren’t worth putting up on Instagram or Facebook. Also, despite being owned by Facebook, you can only import phone contacts, and not Facebook friends. But then again, it’s just launched, so you can expect that to change soon. Instagram Bolt is available for Android and iOS devices now, but only in 3 countries, South Africa, New Zealand and Singapore, a rather odd mix. Since more than half of Instagram users are from outside the United States, it’s safe to say that Bolt will be launched in other countries as well soon, but we can’t say when. It is quite interesting to note that it wasn’t launched first in the United States, its country of origin. So what do you think of Instagram Bolt, will it fade into oblivion or become the next big thing?